A professor at a Pennsylvania college has been working in recent weeks to have the school revoke a conservative group's status as a student organization, arguing that it leans in a "homophobic, sexist, racist, and anti-Muslim ideological direction." Wendy Lynne Lee, who teaches philosophy at Bloomsburg University of Pennsylvania, says that Turning Point USA (TPUSA), a nonprofit organization that promotes limited government, advances bigotry with its views. TPUSA—which says its mission is to "identify, educate, train, and organize students to promote the principles of freedom, free markets, and limited government"—has a chapter on Bloomsburg's campus. Lee recently reached out to political science professor Neil Strine, who advises the Bloomsburg College Republicans, to express her concerns about TPUSA and why she believes the group should not be allowed on Bloomsburg's campus. "Were it the case that TPUSA and its BU [Bloomsburg] Chapter were just what the TPUSA describes—a conservative/libertarian/Pro-Capitalism group—that would be just fine," Lee wrote in an email chain obtained by the Washington Free Beacon. "But TPUSA has a number of other serious issues." Lee decried that the David Horowitz Freedom Center, a conservative foundation she described as bigoted, is one of TPUSA's partners. The Freedom Center is "dedicated to the defense of free societies whose moral, cultural, and economic foundations are under attack by enemies both secular and religious, at home and abroad," according to its mission statement. Lee also said in her initial email that another TPUSA partner, the Heartland Institute, a self-described "free-market think tank," is "devoted to fueling the machinery of climate change denial." She argued in a series of emails that TPUSA promotes a "white supremacist and misogynist worldview" and "far-right authoritarianism with … a patently racist, sexist, and homophobic agenda." According to Bloomsburg's Department of Philosophy webpage, Lee's areas of specialization include environmental philosophy, feminist theory, and philosophy of mind. Lee said her main problem is that TPUSA uses the Bloomsburg name and logo on social media in conjunction with its chapter on campus. TPUSA should not be permitted to have an official presence on Bloomsburg's campus, according to Lee, because it suggests the university and the Community Government Association (CGA) align their mission with that of Turning Point. CGA is Bloomsburg's student-run, staff-advised group that approves all organizations that seek to receive official recognition as a university club. Strine told Lee that students in College Republicans wanted him to advise another conservative student organization and brought TPUSA to Bloomsburg. "I asked them what the organization was about and they said that it was similar to the College Republicans, but was more consistent with the idea of limited government, less taxes and spending, etc.," Strine wrote. "So I agreed to sign off as an adviser." Strine said that TPUSA's Bloomsburg chapter stands for the ideals listed on Turning Point's website and that "they do not have any sinister intentions beyond advocating a conservative agenda." Lee wrote back that TPUSA's views are "plainly way out of the rational mainstream" of "conservative/libertarian politics." "These are folks who'd support Roy Moore for the Senate, birthers, truthers, climate change deniers, and white supremacists," Lee added, referring to Alabama Republican senatorial candidate Roy Moore, whose controversial views have gained national attention in recent months. Lee then emailed Thomas McGuire, assistant vice president of marketing and communications at Bloomsburg, to report TPUSA for using the school logo and claiming university recognition. When McGuire did not respond, she emailed him again, saying that TPUSA is "not a group that BU/CGA should endorse" because "it's mission is anathema to university education and culture." "This is not about freedom of speech—unless, of course, the university is looking to align itself with white supremacist organizations who'd silence its minority voices," Lee wrote. "This is not a libertarian organization; it is a white supremacist one." McGuire replied that because TPUSA is approved by CGA, the group is allowed to use the university's name and logo on its Facebook page. The only way to change that privilege, McGuire wrote, is for CGA to revoke its official recognition of TPUSA. Lee likened TPUSA to the Ku Klux Klan in a follow-up email, asking whether Bloomsburg would grant the KKK recognition as a student club if it came to CGA with a different name and misrepresented itself as something it is not. In her emails, Lee included a link to her personal blog post from Dec. 2, 2016, in which she attacked TPUSA and its Professor Watchlist project, a site that aims to educate students, parents, and alumni of "specific incidents and names of professors that advance a radical agenda in lecture halls." In her blog post, Lee alleges that Turning Point's founder and executive director, Charlie Kirk, is the "up-and-coming poster child for the alt-right." A spokesman for TPUSA told the Free Beacon that Lee's efforts to label the group as white supremacist are "ridiculous." "To suggest that Turning Point USA and our diverse group of student activists is in any way supportive of white supremacy is ridiculous and more directly speaks to the derangement of the radical left on many college campuses," said Jake Hoffman, communications and media director for TPUSA national. "A professor is exploiting an administrative process in an attempt to silence ideas and opinions she disagrees with," he added. "The long-term negative consequences of this type of ideological censorship should be deeply concerning to everyone." Following Lee's email exchanges with Strine and school officials, an unidentified faculty member began protesting Turning Point's presence on campus, local ABC affiliate WNEP reported on Oct. 29. 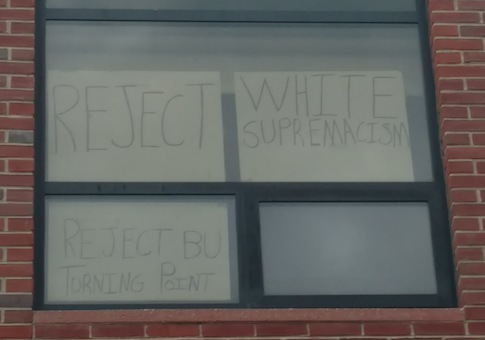 Signs appeared in a window of one of the academic buildings that read, "BU Turning Point = Alt-Right = White Supremacist." The next day, Bloomsburg student Zac Mrochko sent a picture to the Free Beacon of another sign that read, "Reject White Supremacism, Reject BU Turning Point." WNEP did not identify the faculty member behind the protests but did contact a university spokesperson, who said the demonstrator believes TPUSA is a front for white supremacy and the signs aim to bring attention to that viewpoint. The school ultimately decided to hold a meeting to determine the fate of TPUSA on campus. Mrochko, secretary of the university's TPUSA chapter and vice president of College Republicans, said that students in the chapter were told they were not allowed to attend the Nov. 8 meeting and present their perspective on the matter. Strine, however, said that Dione Somerville, vice president of student affairs, has been in contact with the students in private meetings to hear their perspective and kept a line of communication open. After the meeting was scheduled, Lee sent another email that was obtained by the Free Beacon. Lee wrote that TPUSA's presence on campus was either a "ploy" by the College Republicans to get more university funding from CGA or a cover for the organization's "real motives" to promote "patently racist programs, truly fake news pieces, and a deeply anti-Muslim agenda." In response, Strine indicated that student political organizations do not receive any funding from CGA and rejected Lee's "inflammatory and false allegations" against himself, the students who brought TPUSA to Bloomsburg, and the organization itself for being a "hate group." Nothing of substance was decided at the meeting between several professors (including Lee and Strine), staff, and administration officials. "Nothing was decided; we are going to meet again," Strine said, indicating there would be another meeting after Thanksgiving break. "Overall, I'm very pleased. It was a very positive meeting. I thought Dr. Somerville and the BU administration was extremely fair, and I look forward to the next meeting." Strine said the evidence Lee presented at the meeting to support her argument was a list of professors who had been targeted by Professor Watchlist. "There was a packet of information that shows Muslim and minority professors that have supposedly been targeted by the watchlist," Strine said. "They were arguing that because Turning Point's national chapter has a professor watchlist, which they say goes against academic freedom, then the student group is complicit in what the national group wants to do." On the same day the meeting was held, Professor Watchlist's featured professors on its homepage included four white professors and two black ones. Strine said that Lee claimed in the meeting that when "you connect the dots," TPUSA has connections to the alt-right and white supremacy. The TPUSA chapter at Bloomsburg has not yet contacted any national members of the group because nothing substantive has been decided. But Hoffman says the chapter does have access to the organization's national, regional, statewide, and local field staff in case they need assistance. "False claims and baseless attacks are a sadly common tactic employed by leftist professors, and we deal with each issue on a case-by-case basis," Hoffman said. This entry was posted in Culture and tagged College Campuses, Pennsylvania, Republicans, University. Bookmark the permalink.